Harvest yellow dock seeds in the late summer and fall when they have turned a rusty brown color. Place them in a brown paper bag and leave this on its side for a couple hours or overnight (this lets any bugs that may have been living in the seeds crawl out) Go through the seeds picking out any leaves or other debris. Place in a blender or food processor until it is ground into flour. Add this hearty flour to pie crusts, breads, crackers or tortilla chip recipes. on a well-floured surface, roll dough as thin as possible. Cut into desired shapes or transfer it whole to a well oiled cookie sheet. Bake for 10 – 12 minutes at 375 or until crisp. 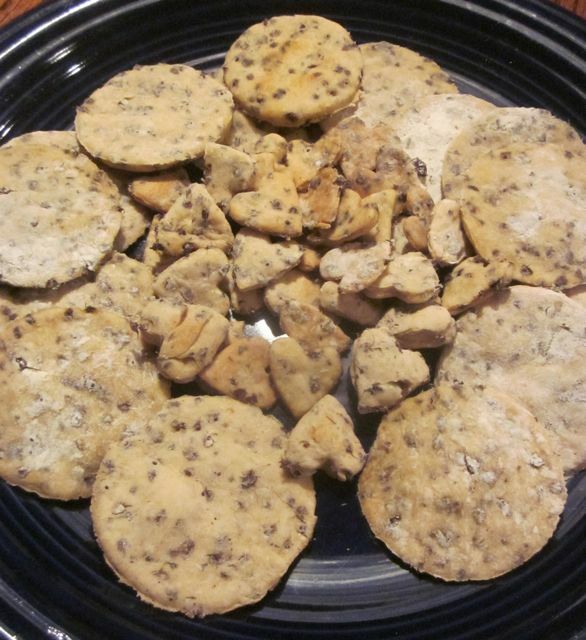 These hearty crackers are great with Brie or goat cheese. The young tender leaves of yellow dock are a wonderful spring green that can be eaten as a salad or cooked as a potherb. Mix them in with other salad greens. High in iron the leaves also contain significant levels of calcium, potassium, and beta carotene. They have a slight lemony twang to them which indicates the presence of oxalic acid. limit intake.